Changing the course of its season in a matter of weeks, Boulder City High School boys volleyball team picked up a monumental 3-1 victory over Somerset Academy Sky Pointe on Monday, April 8. 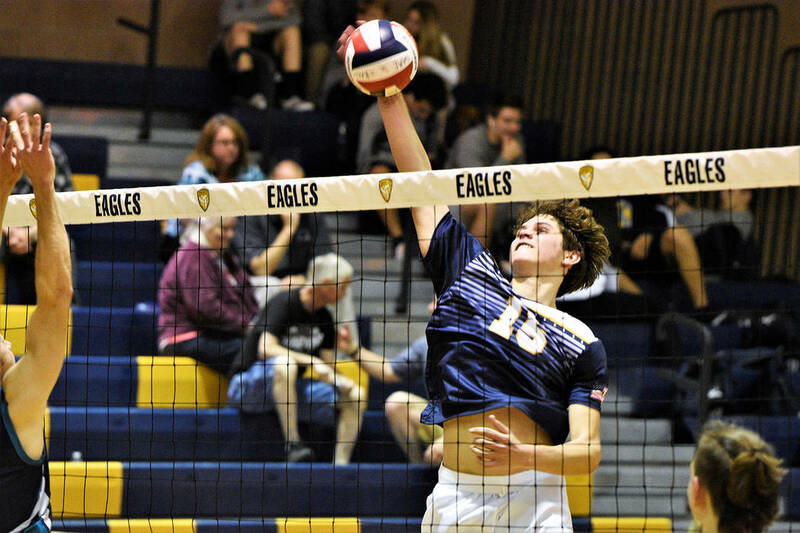 (Robert Vendettoli/Boulder City Review) Rising up for a thunderous kill, Boulder City High School junior Boen Huxford gives the Eagles a point against Somerset Academy Sky Pointe on Monday, April 8. The Eagles won 3-1. The Eagles advanced their win streak to eight games, making up for their league-opening 3-1 loss to Sky Pointe on March 19. Playing above and beyond on both sides of the ball, the Eagles recovered after dropping the first set, rolling to a 25-27, 25-18, 25-21, 25-17 victory. Spreading the ball around offensively, senior Karson Bailey led the way with 21 kills, while junior Preston Jorgensen added 18 kills. Playing a large role as new contributors, junior Dylan Leasure added 11 kills and junior Boen Huxford generated nine kills. “I think the team played really well,” Bailey said. “We got a ton of contribution from all the players on the team from hitting and blocking to digs and great sets. It was an exceptional team effort and I was really proud of all our players performances. Setting up their teammates for key points, freshman Kenny Rose dished out a game-high 27 assists and Boen Huxford tallied 23 assists. Defensively, Bailey generated 16 digs and four blocks and Jorgensen tallied 15 digs and three blocks. Junior Gavin Balistere added three blocks. Defeating Somerset Academy Losee 3-0 on April 4, the Eagles rolled to a 25-8, 25-10, 25-17 victory. Jorgensen generated a game-high 16 kills, while freshman Kannon Rose made 14 digs defensively. Junior Braden Soileau added five serving aces. Set for another stiff test, Boulder City will travel to Del Sol today, April 11, with hopes of avenging their March 25 loss to the Dragons. Coach Huxford knows a target will be on their back moving forward.